With the Quicksilver Activ 505 Open, you’ll want to be on the water all day. Whether it’s for fishing, relaxing, or a bit of both. The boat looks sportive on the outside and feels spacious from within. Just how spacious? Get aboard with up to 5 people and discover its interplay of practicality, ergonomics and comfort. 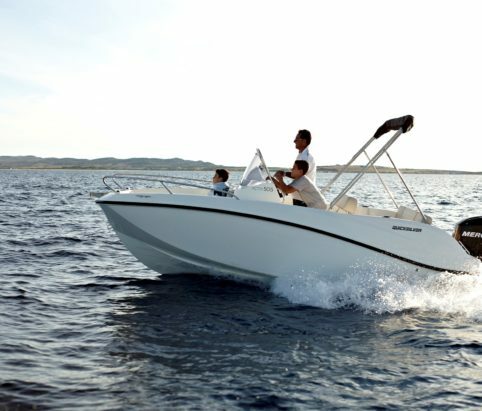 The Activ 505 Open also comes in a Smart Edition that includes its most popular options. A single Mercury outboard engine with up to 100 hp powers the Activ 505 Open. In other words, safe and smooth navigation is a given. The high freeboard and the ease of circulation aboard add to this secure feeling, both for adults and children alike. Easy access from the bow and an integrated double swim platforms encourage activity, going on and off the boat and in and out of the water. A slightly tinted windshield improves the driver’s visibility at all times. A reclining aft seat optimizes the available cockpit space while still making it possible to tilt the engine entirely. The stylish bicolour helm caters to the driver’s needs, whether you’re seated or standing up. It contains integrated cup holders, a storage tray and a mounting space for a 7” GPS/Chart Plotter. A footrest makes you feel even more comfortable while behind the wheel. And even with the sun lounge deployed, access to the console remains completely free. Every section of the Activ 505 Open serves multiple purposes. The bow seating area transforms from a basic sun lounge into an extended one within seconds. And at dinner time, you install the exterior table just as quickly. Moving on to the cockpit, the flip-flop backrest is bidirectional and can be moved forward. That way, the cockpit becomes a socialising area with driver and passengers facing each other.